Preproduction work continues on the movie adaptation of The Poet of Tolstoy Park. The screenplay was written by Tom Epperson who wrote, among other things, "The Gift" starring Cate Blanchett, and "A Family Thing" starring Robert Duvall and James Earl Jones. Epperson is frequently a writing partner with Billy Bob Thornton. Sonny wrote the screenplay for Cormac - The Tale of a Dog Gone Missing. Sonny is working closely with Fisheye Filmworks, whose managing partner is film producer Scott Lumpkin. Scott graduated high school in Fairhope, went to film school, and got in the movie business as a line producer, and has now produced several feature films. Mac Walcott, Fairhope architect and writer, is the creative partner at Fisheye Filmworks. Producer David Bushell ("Slingblade" "Eternal Sunshine of the Spotless Mind" etc.) is also on board, helping the Fisheye Boys to get Poet made before Sonny is too old to go to the movies. 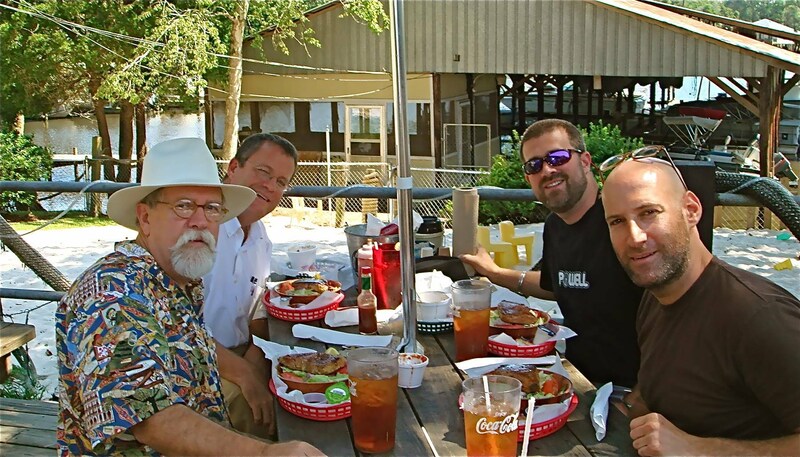 TOP: Power-lunching at Big Daddy's Grill on Fish River. (L to R, Sonny, Mac, Scott, and David Bushell.